On April 20, the Orangetown Police arrested Connor Phelan (20 of Tappan, NY) for Grand Larceny and Criminal Possession of Stolen Property, both in the 4th degree, and Unlawful Possession of Marijuana. A homeowner in the area of Gregg Court called the police after he observed Phelan go into an unoccupied, parked car, remove several items from it and exit with said items. Items included a laptop, a camera and a Swiss army knife. The officers tracked him down and arrested him. The items were returned to the owner of the car. 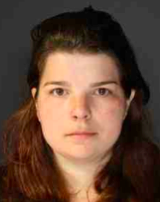 Kathleen Anne Keffner (21 of Bardonia) was arrested by the Orangetown Police for Endangering the Welfare of Incompetent and Endangering the Welfare of a Child. The police responded to a home in Pearl River in response of a call from the victim’s mother about possible child abuse by the home health aide. Upon police arrival, the victim’s mother showed the police a home security video of Keffner psychically abusing the child. Keffner was arraigned in court and will reappear in court on June 20. On April 22, the Orangetown Police arrested Christopher C. Berson (33 of Thiells, NY) for Aggravated DWI and Leaving the Scene of Property Damage automobile accident. A resident on High Ave. in Nyack heard a loud crash and saw a gray vehicle leaving the scene. The resident saw the vehicle’s registration number and reported it to the police. After tracking down the vehicle and speaking with the driver, they observed a strong odor of alcohol on his breath and his bloodshot eyes. Berson failed several sobriety tests on the scene and was transported to headquarters where he failed his breathalyzer. He was more than two times over the legal limit. He will appear in court on May 17 to answer the charges. 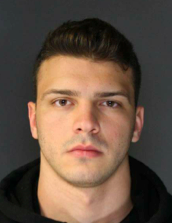 On April 19, the Orangetown Police arrested Burim Sinnanaj (23 of Blauvelt) for Assault in the 2nd degree. It is alleged that Sinnanaj was involved in an altercation with another male inside a Pearl River bar. Sinnanaj struck the other male in the eye, causing a laceration to his face that required medical attention. He fled from the scene but the police found him and brought him into headquarters. He will appear in court on May 3 to answer the charges. Robert Motter (age 39) is wanted by the Ramapo Police for False Personation. The charges stem from an incident that had occurred in the Village of Hillburn in March 2016. Motter is 6’4″ and weighed 235 lbs. at the time of the arrest Anyone with information regarding his whereabouts is asked to contact the Ramapo Police at (845) 357-2400. The Ramapo Police, alongside the Orangetown, Clarkstown and Haverstraw Police Departments have been investigating reports on auto stripping. They recently arrested a 27-year-old female, a 55-year-old man and a 29-year old from Patterson, New Jersey for stealing and selling car parts. They were charged with Grand Larceny in the 4th degree and Auto Stripping and Criminal Mischief in the 3rd. Sunil Rajan, 41 year-old male from Suffern is wanted by the Clarkstown Police for Possession of a Controlled Substance. He is a white male who has black hair and brown eyes and stand 5’4″. Anyone with information is asked to call the Clarkstown Police at (845) 639-5880. Suffern Police Arrested a Mahwah woman for Aggravated DWI and Criminal Possession of a Controlled Substance this weekend. Officers responded downtown on a report of an erratic driver. Police located the driver on Chestnut Street and determined that she was in fact intoxicated. After being taken into custody, she was found to be in possession of a prescription drug without a prescription. Her breathalyzer at headquarters had her over 3 times the legal limit. She is pending a future court date.